After a 5-year hiatus, the infamous Eight Bit Studios podcast has returned to clog the internet with unbleached enriched Chicago tech talk. Segments include following a technologist on her journey to get a date through Chicago tech meetups, a new mobile app that features prominent Chicago Tech leaders and former guests from season 1, and a true story about the Loch Lochy monster. 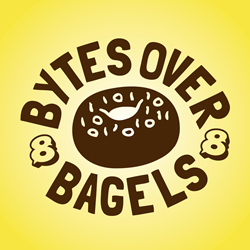 Premiering in 2013, Bytes Over Bagels quickly became a favorite weekly podcast for the Chicago Tech scene. Broadcasting for 40 straight weeks, the group interviewed some of Chicago Tech's most coveted personalities and opened the doors for many in the blossoming start-up industry. Former podcast guests of Bytes Over Bagels include Troy Henikoff from TechStars, Maria Katris CEO of BuiltIn, Sean Reigsecker Founder and CEO of Centro, Check Templeton Founder of OpenTable, Jake Nickell Founder and CEO of Threadless, Brian Spaly Founder and CEO of Trunk Club among others. Season 2.0 will bring some tasty surprises and awkward format changes as our colorful hosts open the time capsule from Season 1 to catch up with previous guests to find out what they've been doing for the last 5 years and find out how their careers and the industry has changed. The podcast highlights new local music and touches on the tech industries hottest topics. The show also includes a new segment to help a UX strategist find a date through Chicago tech meetups. A new app is highlighted called Techagotchi that features many of the guests interviewed in season 1. Finally, a true story about a firsthand account with the Loch Lochy monster.